NATURAL RESOURCES: The Cadiz Sand Dunes, with their unique flora and fauna, are the focal point of this wilderness. 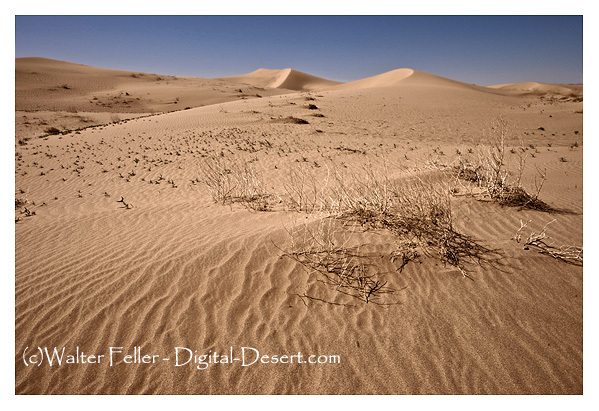 These low dunes were formed from the winds pushing sands from Cadiz Dry Lake, which is outside of the wilderness to the west. Desert dunes habitat. ACCESS: Travel 62 miles east of Twentynine Palms on State Highway 62. Turn north and follow the graveled Cadiz Road for 26 miles. The next 5 miles of the Cadiz Road forms the eastern boundary of the wilderness. Cadiz Road is passable by two-wheel drive vehicles, but the southern and northern bound routes require four-wheel drive vehicles.